Egyptian Turmoil: Will Hawass Survive a Regime Change? 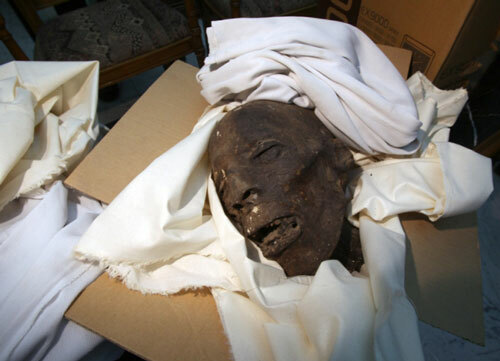 may not have hurt his chances to continue running Egypt’s antiquities. Henig linked to CultureGrrl for my aggregation of reports that (in her words) “suggest that more harm has been done [to antiquities] than Hawass has let on.” I had quoted mainstream media sources (CNN, Associated Press, Al Jazeera) as well as Egyptologist Margaret Maitland‘s ears-to-the-ground The Eloquent Peasant blog. I was careful to note, though, that online reports from Egyptologists had not been officially confirmed. fire….I am a man of honor, and I would never hide anything from you…. particularly those on the south side of the Unas Causeway. public cannot go to the site as the army forbids it. For additional photos from the Egyptian Museum amidst the turmoil, recently posted on Hawass’ website, go here and then keep clicking the “next” arrow at the top of the image.